I’ve said many times that the X-Men are my favorite team in comics. I also think that they are Marvel’s greatest creation and one of the greatest creations in comics. I wrote a piece about that very topic last year and I still think it’s one of my best pieces I’ve written. They were created during one of the most turbulent times in American history. Stan Lee and Jack Kirby risked a lot by creating a team of mutants who the world treated as the lowest form of human life. You’d have to be insane to not notice the similarities in rhetoric when some villain in the comics talked about how the mutants were “animals” and “uncivilized.” The same men in real life preached those same values about black people, gays, Muslims, and anyone who they didn’t like. It was one of the worst times to be anything other than a white male. 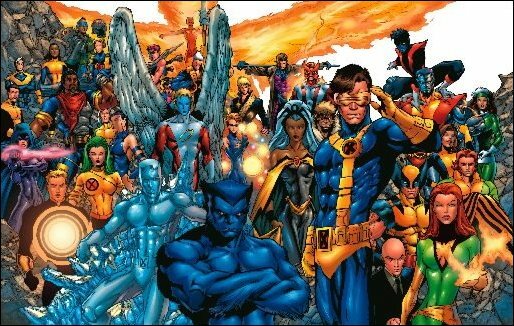 The X-Men stood for diversity when no one else did. Anyone, and I mean anyone could read those comics and at some point see someone who represented themselves. It’s kind of funny though. Today, people claim that politics and societal issues don’t belong in comics. Some of the greatest things in comics were written with the political landscape of the world in mind. I truly think people use it as an excuse for denouncing views, particularly about minorities, that they don’t agree with. The X-Men continue to fight the good fight when it comes to diversity and representation, and recently, they’ve had a resurgence in the comics. Over the past few months, the X-Men have gone under major reconstruction in the comics. The main reason being there comics haven’t been that great. Marvel has unleashed brand new X-books to the world and the ones I’ve read have been great. This resurgence comes off the heels of the Marvel event Inhumans vs. X-Men. This wasn’t my favorite event at all, but I enjoyed it for what it was. The thing that makes a good event to me is the cohesion of the plot. And not only cohesion, but those moments in the story that make you gasp. This story didn’t have too many of those, but the plot was straightforward and simple. The Terrigen Mists were engulfing the Earth and killing mutants. Emma Frost, using her psychic powers, tricked everyone into thinking that Cyclops was alive when in fact, he died from Terrigen inhalation much earlier. Frost made Cyclops give a passionate speech in front of all the mutants and Inhumans. When Medusa, queen of the Inhumans told him to move from the Terrigen cloud, he refused. Frost convinced everyone that Black Bolt killed Scott Summers in cold blood. A clear declaration of war. This was the catalyst for the event. The mutants took action and trapped the Royal family in Limbo. The younger Inhumans made a move but soon realized that the two races needed to work together. Medusa ended up being the one who destroyed the last Terrigen cloud. It was a straightforward event but it was the starting point for this new direction of comics, for both the X-Men and the Inhumans. The X-Men have a number of titles out right now. My favorite being X-Men Gold, X-Men Blue, and Cable. But today, I want to focus on the first issue of Astonishing X-Men. The main reason is because when this title was first announced, I couldn’t wait to read it. Mainly because of writer Charles Soule. He’s one of my favorite writers in comics today. I highly recommend his current run on Daredevil. He co-wrote Inhumans vs. X-Men as well. He knows how to craft great plots, but also bring up brilliant, powerful moments from a character’s past. The perfect example of that is Daredevil. Astonishing X-Men is following that same trend of Soule digging up old secrets and making something cool out of it. And it all starts with Psylocke. First thing first, the art in this first issue was amazing. Pencils were by Jim Cheung and there were a slew of inkers and color artists on it as well. It starts off with narration. A cliché in comics, but if done right, can set the tone for the entire story. This person is talking to us, the readers about psychics. The person talks about how freeing it is to be a psychic, how it can empower people to become something truly great, and how it can tear others apart. We see a blind psychic experiencing her powers for the first time. Then, the unthinkable happens. The narrator talks about killing feeble-minded psychics. We see psychics from around the world, alone and dead. Psylocke is the narrator’s next target. She’s one of the most powerful psychics in the Marvel Universe and one who doesn’t live her life alone. She’s been a part of the X-Men and people know who she is. Still, the villain attempts to take over her mind. She’s overcome with dark energy and it takes the shape of a monster that starts to destroy London. I said that the X-Men have been showcasing diversity longer than anyone. This team is no exception. I love the first issue of this comic because we see the other members around the world before Psylocke calls out to them for help. Bishop, Angel, Gambit, Fantomex, Logan, and Rogue. All have history with the X-Men, but they weren’t the team this villain was expecting. We get more narration about these characters and what their damage or their “Apocalypse” is. 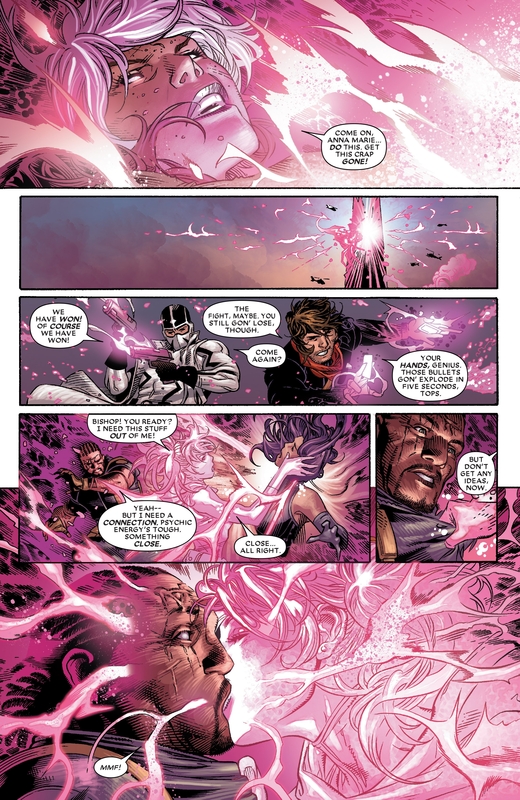 As Psylocke continues to destroy London, the rest of the team arrives due to her distress call. Rogue decides to step up and try to absorb the energy from Psylocke. I love this moment because Rogue is such a great character who was one of my favorites growing up when I used to watch the X-Men animated series. This issue is action packed. It’s one of my favorite thing about X-Men comics. While their comics made a name for talking about hard issues and diversity, some of the best X-Men stories involve crazy action. They handle things that sometimes even the Avengers couldn’t deal with. Psylocke continues to rampage and Logan jumps down onto the street to make sure everyone is safe. Fantomex and Gambit continue their banter, fighting on the street. Bishop, one of my favorite X-Men characters, is on the street when Angel picks him up and takes him to eye of the storm where Rogue is trying to suppress the energy in Psylocke. To do it though, she needs Bishop to absorb it out of her once she absorbs it out of Psylocke, so he can turn it into a different energy than the dark energy consuming them. To do this, he needs a strong connection though, so Rogue plants a kiss on Bishop and the energy is transferred. All is well, except it isn’t. London is saved for the time being and Psylocke regains her composure. She tells the rest of the team that this was just the beginning and they have no time to waste. The rest of them continue to banter when she tells them that the person who took her mind over was Amahl Farouk, the Shadow King. He’s a legendary X-Men villain who everyone thought was dead. Psylocke explains that he wants to take over the psychics of the world and watch the world burn. She tells the team that she can send them his realm, the astral plane, but they have to stop him immediately. I love all of this setup because Soule is crafting an interesting story and the setup is perfect. Beast shows up as well and he’s one of the members who goes to the astral plane. Everyone except Bishop and Angel go. The issue ends with the Shadow King talking. He’s talking about how futile the X-Men’s attempts are. Because in his realm, the “Apocalypse” is secrets. 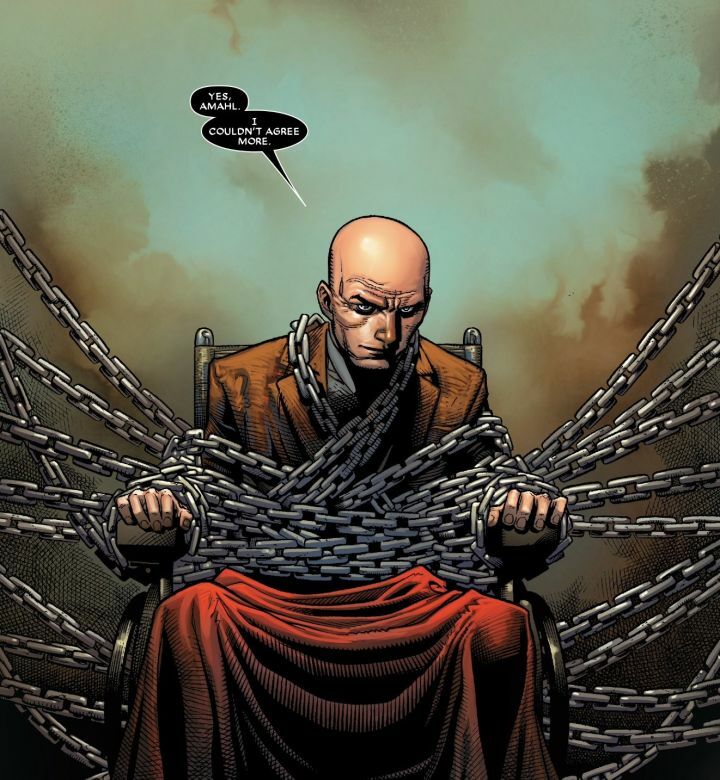 The last page is a chained Charles Xavier, agreeing with the Shadow King. If you follow me on Twitter, I’ve said it numerous times before. The X-Men are back. They represent diversity and have some of the best stories in Marvel history. Soule is one of the best storytellers in Marvel right now. He loves calling back to the original stories that made these characters great. I have no doubt this run will be entertaining. The team they assembled for this run is great too. I could have done without Gambit and Logan, mainly because they’re both heavily featured in X-Men: Gold, but they are good characters nonetheless. Mystique is on the cover but she didn’t show up in this issue. I’m interested to see how she fits into this story. I could also do without Beast as well. My favorites on this team are without a doubt Rogue and Fantomex. I’m interested to see how this team gels together. A popular thing now in comics, and storytelling in general, is putting together a misfit team of heroes and watching them go. I have no problem with that because the other teams we have in the X-books mesh quite well together. Going to be nice to see a team bicker a bit about past relationships. If you’re reading this review and couldn’t pick up the first issue, I highly recommend checking this story out. If not, I’ll be reviewing every single issue that comes out during this run, so you can always read my reviews to get a grasp on the story. The X-Men are back!!! I really hope you enjoyed this review! The X-Men are special to me and I can’t wait to review this series. Be sure to look on my site for anything else you might want to read. I plan on continuing my “Why I Love” series soon and I’m reviewing the new Planet of the Apes trilogy next on Peace, Love, and Comics. You can follow me on Twitter @PeaceLoveComics for updates on these reviews and just my everyday thoughts. Until next time, everyone! I did enjoy this review and it was actually really helpful! Like you, I’ve always loved and appreciated the X-Men for how they integrate social justice messages into their narratives, always representing and standing with those who are living on the margins of society. I was really intrigued by the team in this title (and Charles Soule’s writing too!) and was debating about picking it up. There’s always only so much money to go around for the comic budget you know? But after reading this, I think I might have to check this out!